1 Preheat oven to 425°. Spray 12-cup muffin pan with no-stick cooking spray; set aside. 2 Combine milk, Hellmann's® or Best Foods® Real Mayonnaise and eggs; whisk in flour and salt just until smooth. Evenly spoon batter into prepared muffin pan. 3 Bake 20 minutes or until deep golden brown. Serve warm. Variations: For Cheesy Popovers,  add 3/4 cup shredded cheddar cheese and  1/4 teaspoon ground black pepper. For Extra Zesty Cheesy Popovers, add 1/4 teaspoon hot pepper sauce. For Herb Popovers, add 1 teaspoon chopped fresh herbs. 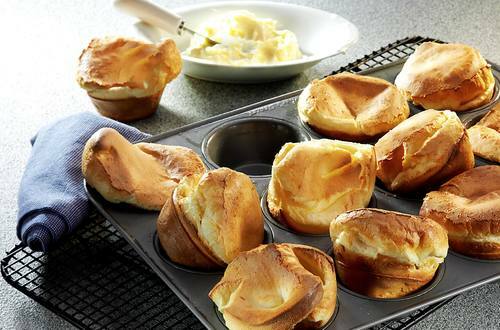 TIP: To bake in popover pans, spray 6-cup popover pan with no-stick cooking spray. Prepare batter as directed and pour into prepared pans. Bake at 450° for 20 minutes. Decrease oven to 350° and bake an additional 15 minutes or until deep golden brown. Makes 6 servings.